Now that the dust is beginning to settle from a fairly hectic May — Prey, Injustice 2 and Gun Media’s long-in-development horror Friday the 13th: The Game, to name but three — the industry is quietly beginning to wind down in anticipation of the annual summer lull. E3 2017 is right around the corner, too, and now that Shadow of War has officially been bumped back to October, the next two-to-three months will lend players the chance to wrestle with that ever-mounting backlog. But there’s one more AAA title about to speed onto PS4. Its name? DiRT 4, Codemasters off-road racer that takes the foundations of DiRT Rally and projects them onto a much bigger canvas. The result is a white-knuckle ride that will seemingly appeal to veterans and newbies alike, and the Your Stage feature is arguably one of the more intriguing additions to the experience. It’s just one of the many new features that make up the full package, and below, we’ve compiled everything you need to know. So, you’re ready to get behind the wheel? Not so fast! In anticipation of its launch on June 6, we’ve scoured the four corners of the internet — and the PSLS archives — to compile all the necessary information you could ever need pertaining to Codemaster’s off-road racer. 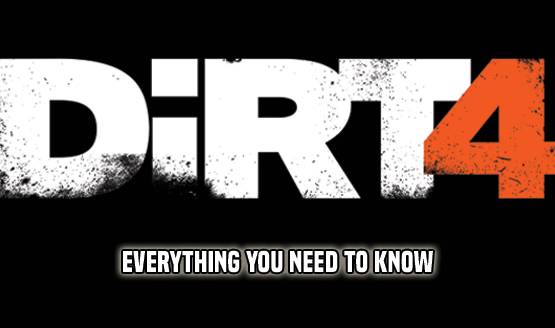 DiRT 4 will make a beeline for PS4, Xbox One and PC on June 6. Stay tuned to PSLS over the coming days for our official review of Codemasters’ latest dalliance in the racing genre.